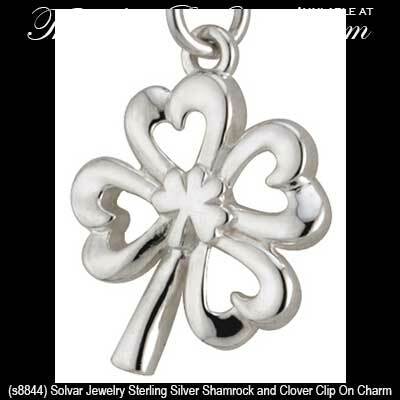 This sterling silver charm features a small shamrock set on a four leaf clover. The shamrock clip on charm is complete with a lobster claw catch and measures 1/2” wide x 1" tall, including the jump ring and the catch. The sterling silver charm is made by Solvar Jewelry in Dublin, Ireland and it is gift boxed with a shamrock history card that is complements of The Irish Gift House. Sterling silver shamrock charm features an open design along with a lobster claw catch. 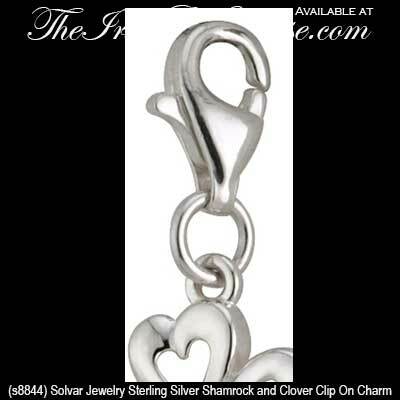 Sterling silver shamrock charm is a heart shape design that features both crystals and enamel along with clovers.